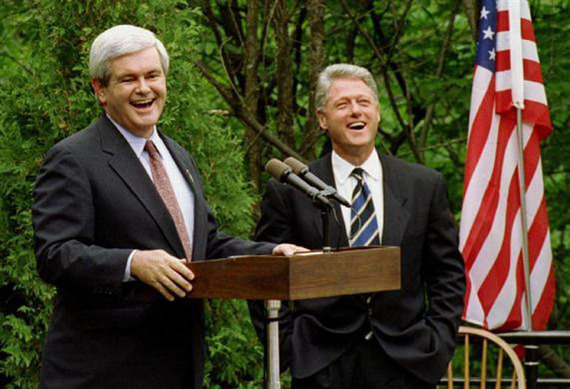 Newt Gingrich and Bill Clinton "Government Shutdowners Of Today Are Sissies"
Former President Bill Clinton and House Speaker Newt Gingrich called out today's would-be government shutdowners as a bunch of sissies. Reminiscing about the differences between the shutdown of 1995 and a potential one before the end of 2015, the two former leaders of their parties called out today's players. "That's right, sissies," Clinton said. "Now man up and shut the thing down, already." Adding, "I'm warning ya. Don't wait until Hillary's President. She frightens me a little." Gingrich added, "President Clinton's right. These guys have it way easier than we did. What's that Paul Ryan worried about? He'll still be able to spend plenty of time with a bunch people acting like 7-year-olds... and his kids, too." When asked about a backlash from government-run entities like the National Parks being shut down, Gingrich said, "Frankly, my side looks out at that great wilderness and sees gorgeous 18 hole golf courses for as far as the eye can see." Clinton, "We Dems think they would make great harvesting areas for publicly-grown marijuana farms." Gingrich: "You say potato, we say potato, but don't call the whole thing off. A good shutdown does a country good." Both men also agree the shutdown brought people closer together. "Hardship will do that, and besides these guys have it easy," Clinton said, adding, "Back in our day we had to eat Domino's Pizza for days on end. And not the new extra cheesy recipe but that cardboard tasting crap." Both men added that the shut down had nothing to do with alleged extra-marital affairs each man had. But as Clinton said, "All that extra time at the office. It certainly didn't hurt." The two men then high-fived.